When one hears the words “Bowman Gray Stadium”, a thought is conjured up of a hot summer night at NASCAR’s longest running weekly track. The flat 1/4 mile oval that most drivers refer to as the “Bullring”, but is more famously known as “The Madhouse”, beckons you each week to come be a part of another night of history. Tempers will flare, guaranteed! Fans will motion to the drivers that they are number 1…take that 2 different ways. But it wasn’t always that way. In fact, when it was built, auto racing was not a part of the thought process. In 1936 the city of Winston Salem wanted to build an all purpose outdoor stadium that could be used for sporting events, concerts, dances, pageants, and band competitions. Ground was broken March 21, 1937 on land in the southeast corner of Winston Salem near Winston Salem State University. The city of Winston Salem funded this project with a Works Progress Administration allocation from a generous donation from RJ Reynolds Tobacco Company president Bowman Gray’s family in his memory. A committee comprised of Mayor WT Wilson, city aldermen J Wilbur Crews and Luther E Martin, Winston Salem Journal and Sentinel sportswriter Frank Spencer, and RJ Reynolds Tobacco Company salesman Bowman Gray Jr oversaw the stadium’s planning. The stadium was designed by local architect Harold Macklin and public works commissioner RA Thomas. In February 1938 the stadium was completed at a cost of $200, 000 with a seating capacity of 17, 000. Concrete stands lined both sides of the horseshoe shaped facility with a grassy hill in the south portion between the stands and the north end open. The first event held in the new stadium was a music festival on May 2, 1938 that drew 5000 spectators. On October 22 of the same year, Wake Forest College and Duke University played the inaugural football game at the venue.. In 1954 additional grandstands were added in the south end raising the seating capacity to 20, 001. 1956 was the year that Wake Forest University moved to Winston Salem from the eastern NC town of Wake Forest. Needing a place to play football, the Demon Deacons played their home games at Bowman Gray from 1956 until 1968 when Grove Stadium, now BB&T Field opened. Winston Salem State University still uses the field for it’s home games and in the 1960’s and 70’s many local high schools played their home games there. In 1967 an NFL exhibition game was played there between the Green Bay Packers and Cleveland Browns. Also in 1967 the WS Parks and Recreation took over the maintenance and renovated the stands, press box, scoreboard, lighting and field house. In 2007 a 2 story, 21, 000 square foot field house replaced the old one and a 2 story steel and glass press box was updated. Now back to the image conjured up described at the beginning…racing!! In the mid 1940’s a promoter from the midwest wanted to bring midget cars to the area and settled on Bowman Gray as the place for this venture. The track was made of cinders as most high school and college tracks were. The midget cars tore up the track and the football field and after a couple of years of small crowds and fighting with the city over who should be responsible for replacing the cinders, the promoter gave up on racing at Bowman Gray, saying it could never be profitable. However, a young man named Alvin Hawkins attended one of those races and was bitten by the racing bug. Alvin was good friends with NASCAR founder and President Bill France Sr and thru a joint venture, had the track paved and promoted the first NASCAR race there on Wednesday evening, May 18, 1949. The first race was won by Fonty Flock, whose brother , Tim, would be crowned the first track champion later that year. And history was just beginning. The first three races were run on Wednesday nights. It was a common practice in the beginning days of NASCAR for teams to run as many as 4 or 5 nights a week. Common for that time were races at Bowman Gray on Wednesday nights, maybe Tarheel Speedway in High Point on Friday nights, Raleigh on Saturday nights, and Peacehaven Speedway back in Winston Salem on Sunday afternoons. After the first 3 races, the next 4 in a row were rained out. Thinking there were enough cars around to support 2 tracks, France and Hawkins decided to move their races to Saturday night opposite Raleigh and would also cut down on travel for those that raced at Peacehaven on Sunday. And while the other tracks fell by the wayside, Bowman Gray continued to be popular with the drivers and fans, just as it still is today. Many drivers will tell you that to have a win at Bowman Gray is a milestone. 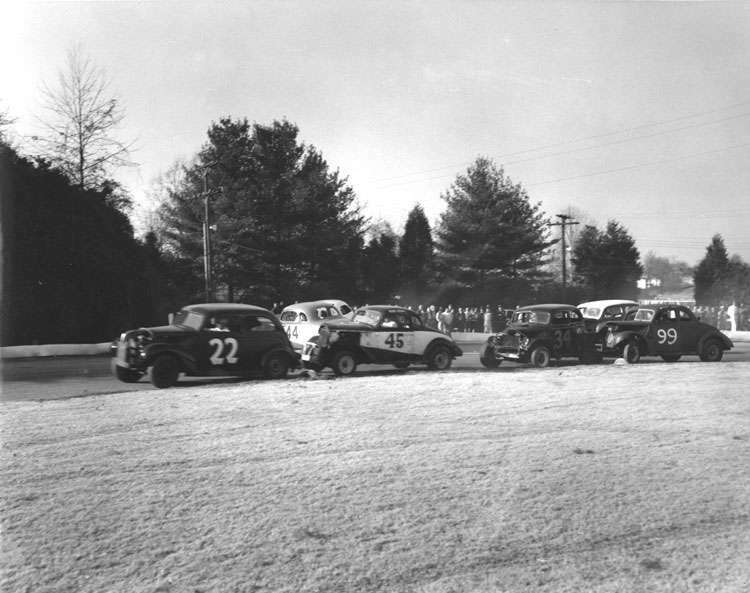 In the late 50’s Modified and Sportsman car counts were getting low, so the track combined the 2 and let the V-6’s and V-8’s run together, with each division still claiming a winner, much like the combination events today of the Whelen Northern and Southern Modified Tours. This combo event ended in 1968 and the Modifieds were deemed the feature division and the Sportsman were renamed the Hobby division. A third division was created in 1964 called the Claiming Division. Anyone that wanted to race could go in the pits after the races and “claim” any car from that division for just $99. If the driver refused to sell, he was disqualified for the remainder of the year. It got so popular that the track had to cut the fields down to 2 races with 10 cars each. This division ran until 1972 when it was renamed the Hobby division and the claiming rules dropped. The old Hobby division was renamed the limited sportsman cars because the cars were “limited” to 6 cylinder engines. In 1974 the Hobby division was renamed the Street Stocks. From 1977-1989 a 4th division was run called the Blunderbust division. These were comprised of huge, luxury cars from the 70’s like Chrysler Imperials, Cadillacs, Buicks, etc. As these cars were also the same kinds used in demolition derbies around the country, the cars became hard to find. In 1990 this division was replaced with one of 4 cylinder cars called the Buzzbombers and in 1991 was renamed Stadium Stock. To begin with there were Vegas, Pintos, Datsuns, Toyotas, VW Bugs…today it is almost 100% Mustangs. Lots of legendary names are on the winners list at Bowman Gray Stadium. From 1958 thru 1971 the Grand National cars, now Monster Energy Cup, raced 29 times at BG. Rex White won 6 GN races, Glen Wood, Richard Petty, and Jr Johnson won 4 each, David Pearson won 3 times, and Bobby Allison won twice. Besides winning at BG, these drivers also have in common that they are all in the NASCAR Hall Of Fame! Other BG winners in the HOF are Ned Jarrett, Lee Petty, Richie Evans, and Jerry Cook. Dale Earnhardt Sr’s father, Ralph Earnhardt, also won here. The nickname “the Madhouse” is attributed to the antics that take place on the tight quarter mile, but it actually came from the format of the 2nd race start being inverted from the first which was known as the madhouse scramble. This feature is still used today in the divisions that run 2 races in the same night. The nickname was probably made the most popular though from the History Channel show titled “Madhouse” which was taped at the track in 2009 and aired January thru March of 2010. It remains one of the most popular shows ever on the History channel, but attempts to bring it back just haven’t panned out. Bowman Gray Stadium’s weekly racing celebrated it’s 1000th event in 2015, something no other weekly NASCAR track has accomplished. The track will open April 20, 2019, still operated by members of the Hawkins family under the name Winston Salem Speedway Inc. The races are part of the Whelen All American Series that supports short tracks all across the country. Tickets are a reasonable $12 each with 4 or 5 $2 ladies night events thru the season. You can’t go to a college sport or minor league baseball game for this price and have as much entertainment! Weekly races for the Modifieds, Sportsman, Street Stock, and Stadium Stock are the weekly agenda, starting at 8:00 and usually over by 11:00. The gates open at 6:00 to watch practice and qualifying and the seats fill up quick. Every week is filled to capacity! More on recent and today’s drivers next time! Excitement everywhere!! Fans like me have been anxiously awaiting April 20th since the 2018 season ended! If you’ve never been, you owe it to yourself to at least experience the excitement once!! Pick any Saturday night from the last week in April thru the end of August, except for the Saturday closest to July 4th as they use that weekend to observe the holiday, The weather may be hot, but the action is hotter!! I say pick an early date because once you go, you’ll be hooked! !